Welcome to A Christian Gaming Podcast! The Gaming Podcast focused on putting God before gaming, being more mindful of our faith while we are gaming, gaming news, and more! Email the Show at AChristianGamingPodcast@gmail.com ! Christian Gaming Podcast 11: 5000 heroes, Pubg gets banned, and why we need to be patient wrenches! 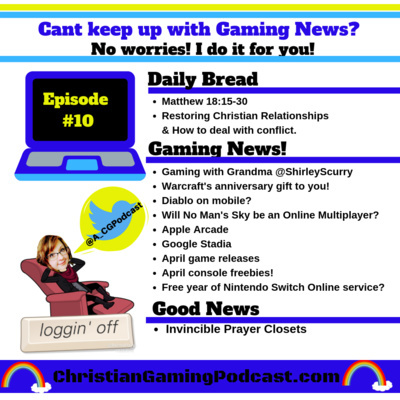 Christian Gaming Podcast 10: Apple wants a piece of the gaming pie! Does the bible tell us how to deal with conflict? What games are coming out this Month? Google Stadia is here! Console Freebies! Christian Gaming Podcast 9: Overwatch gets a new hero! Is Google Getting into gaming? Can Dance moves be stolen? What new games are coming out this month? Christian Gaming Podcast 8: What Games are coming out in March? What new races are being added to Warcraft? Is Sony giving out refunds for Anthem? Console March Freebies, BLOOPERS and more! Welcome to Episode 8 of Christian Gaming Podcast! 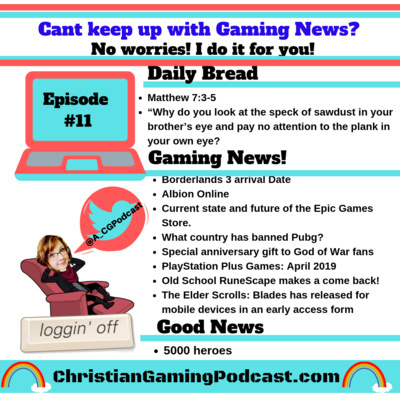 The Gaming Podcast focused on putting God before gaming, being more mindful of our faith while we are gaming, finding games Christians can feel good about playing, gaming news, and more! Follow the show on Twitter: twitter.com/A_CGPodcast Email the Show at AChristianGamingPodcast@gmail.com ! It is February 3 2019 ! I am your host Rainna SwiftSage! DAILY BREAD Man does not feed on Bread alone, so make sure you get your Bible study on before you hop in game! Ephesians 4:29 ESV Let no corrupting talk come out of your mouths, but only such as is good for building up, as fits the occasion, that it may give grace to those who hear. WATCH OUT FOR THAT POLL! https://twitter.com/jaygurrl/status/1101489236430053376 Carrier Pigeon has arrived with some mail! I would like to thank Christian Geek Central for the shout out on twitter and on their show. You can find them on Christian Geek Central .com I want to thank Francisco of the Retro Rewind Podcast for his support of the show too! I want to thank those who have joined the Biscuits Discord so far to say hi and visit! Those like LeviticusSword, Francisco, BloodBought, DisneyGirl Jaygurl, F1v3s, and my gaming pals Goon, Luminin, ScarletFury, The Doc , Fell and Willektron ! Thank you for bringing your awesome to my discord<3 I want to thank those that have made their way over to my Facebook page! Im looking at you Omar, Cayleigh, Carlos and Ben! Thank you! Gaming News! March Game releases Its a new month and that means Xbox Live Gold members can look forward to a few free game. Twitch Prime Free Games for March! Sea of Thieves has an update coming on March 6. World of Warcraft Has a loaded Patch coming out!It will introduce new Races on March 12th! Sony ended production on the PlayStation Vita . Preorder and Save $6 On Pokémon Shield. It appears Sony Interactive Entertainment is offering refunds to Anthem owners, no questions asked. March’s PlayStation Plus freebies ! Community Spotlight http://christiangeekcentral.com/ Christian Geek Central is an online resource and community for Christian Geeks. It is also a network that consists of collection of blogs and podcasts working together to bring you some of the best content on the web for Christian geeks! Closing Thought As we going into our gaming realms this week, let us be intentional and mindful with our actions. What’s something we can do to glorify God in game? Please let me know what you came up with! Send those ideas and any prayer requests ( private or public) you'd like to share to: AChristianGamingPodcast@gmail.com or tweet the show @A_CGPodcast! Christian Gaming Podcast:Really? Another Game Studio Laying off? Xbox continues to unite its player base Which Game Title is leaving Steam and heading over to Epic Games Store now? Christian Gaming Podcast: Is PS5 on the way? Is Xbox going mobile? Amazon Prime Freebies & More! Welcome to Episode 4 of Christian Gaming Podcast! The Gaming Podcast focused on putting God before gaming, being more mindful of our faith while we are gaming, finding games Christians can feel good about playing, gaming news, and more! Follow the show on Twitter: twitter.com/A_CGPodcast Email the Show at AChristianGamingPodcast@gmail.com ! It is February 7, 2019! I am your host Rainna SwiftSage Man does not feed on Bread alone, so make sure you get your Bible study on before you hop in game! What did I learn in the bible this week? Favorite Bible Verse? John 15:5 New King James Version (NKJV) 5 “I am the vine, you are the branches. He who abides in Me, and I in him, bears much fruit; for without Me you can do nothing. The Steam Lunar New Year Sale 2019 Microsoft Confirms Xbox Live Coming To Nintendo Switch, iOS, And Android, including Nintendo Switch and mobile. According to EA CEO Andrew Wilson in the Electronic Arts' (EA) Q3 2019 Results In a tweet from Plants vs. Zombies@PlantsvsZombies On February 5, 2019 Matt Booty, The Corporate Vice President of Xbox Game Studios ARK: Survival Evolved@survivetheark PS5: in our Future? Free Games with Prime What Should We call it? https://www.fantasynamegenerators.com/ Pet Names! Fierce Tyranny Harmonious Sharpshooters Ominous Feast Peace of Rejects Safety of the Hidden Frogs of the Lake Minds of the Jungle Firefury Midnightforce Splitsmiths Closing Thought As we going into our gaming realms this week, let us be intentional and mindful with our actions. What’s something we can do to glorify God in game? Please let me know what you came up with! Send those ideas and any prayer requests ( private or public) you'd like to share to: AChristianGamingPodcast@gmail.com or tweet the show @A_CGPodcast! Christian Gaming Podcast: Apex Legends, Marshmello Concerts, & a PS4 fruit heist? Christian Gaming Podcast: A New Nintendo Switch? Epic Games Store VS Steam, Sea Of Thieves, & more! A Gaming Podcast focused on putting God before gaming , being more mindful of our faith while we are gaming, finding games Christians can feel good about playing, gaming news, and more! 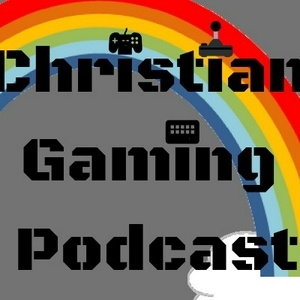 Follow the show on Twitter: twitter.com/A_CGPodcast Follow Rainna on twitter : twitter.com/RainnaPlays Email the show: AChristianGamingPodcast@gmail.com Follow the Show on Facebook here: https://www.facebook.com/A-Christian-Gaming-Podcast-299403380763591/?ti=as Leave a voicemail with the Free Mobile Anchor App! Yesterday, January 31, IGN‏ Tweeted “A new report suggests that a smaller version of Nintendo Switch will be released in 2019 which will be less expensive but come at a cost…” https://twitter.com/IGN/status/1091215066555432960?s=19 Sea of thieves updates MARIO KART TOUR DELAYED TO SUMMER 2019 Epic Games has opened their own game store that is meant to rival that of steam. I Tweeted out to the Twitterverse a poll https://twitter.com/A_CGPodcast/status/1091393080551501826 What should we name it? https://www.fantasynamegenerators.com/ Crumbled War Angelic Warheads Heavens Executors Vengeance of the Obscure Safety of the Crocodile Avenging of Betrayal Faith of the Vanquished Twin Foxes Watermantles Snowfall Community Spotlight! To come soon Closing Thought As we going into our gaming realms this week, let us be intentional and mindful with our actions. What’s something we can do to glorify God in game? Please let me know what you came up with! Send those ideas and any prayer requests ( private or public) you'd like to share to: AChristianGamingPodcast@gmail.com or tweet the show @A_CGPodcast! Christian Gaming Podcast: Stratus Duo, Facebook Dupes Kids, Settlers Of Catan & More! Welcome to Episode 1 of Christian Gaming Podcast! Follow the show on Twitter: twitter.com/A_CGPodcast Email the Show at AChristianGamingPodcast@gmail.com ! It is the 30th of January 2019! I am your host Rainna SwiftSage Gaming News/Chat: Playing Ark Survival Evolved and Ylands! Played a board game called Settlers of Catan at my church's game night and that was a blast! https://www.catan.com/game/catan SteelSeries launches 'Stratus Duo' dual wireless gaming controller for Android and PC Facebook knowingly duped game-playing kids and their parents out of money https://www.documentcloud.org/documents/5694586-Exhibit-KK.html Guild/Tribe Name Ideas! Sore End Elite Sharpshooters Mini Singularity Crew of the Bear Trust of the Obscure Passion of the Deluded Fame of the Woods Burningbane Ravenflayers Highgarde Closing Thought As we going into our gaming realms this week, let us be intentional and mindful with our actions. What’s something we can do to glorify God in game? Please let me know what you came up with! Send those ideas and any prayer requests ( private or public) you'd like to share to: AChristianGamingPodcast@gmail.com or tweet the show @A_CGPodcast! First Episode of Christian Gaming Podcast announcement! Our first Episode is on its way! Make sure to save a spot for us in your podcast catcher thingy! You can follow the show on Twitter @A_CGPodcast !